I tried on a Large glove liner and found it gave me a snug fit over an XL lightly insulated glove and a good fit over a large race glove. So I’d advise you to buy the same size in regular gloves or even lightly insulated gloves. If you have “puffy” winter gloves, you’ll probably need one size larger. 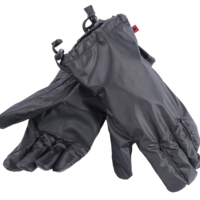 These rain overgloves are a handy thing to have in your emergency rain gear kit. They’ll transform any glove into a water proof glove! Lets face it, dedicated waterproof gloves can get hot and clammy when they aren’t needed for the wet and cold, and its a bummer to pack them if you only occasionaly ride in rain, so glove covers like this can be a good solution for you. However, If you are a daily commuter or long distance tourer and think you’ll be wearing these a lot, then I’d advise getting a waterproof glove for longevity. The build quality of these gloves is just fine, but I don’t think they’ll hold up to everyday use. Dainese says: A robust waterproof addition to any gloves that pulls on in an instant. Totally waterproof fabric with a reinforced palm for superior grip and durability, plus a drawstring wrist fastening to provide a simple, reliable seal.